When I signed up to live in the dorms, I was prepared to live on a diet of peanut butter and jelly sandwiches and eggs. 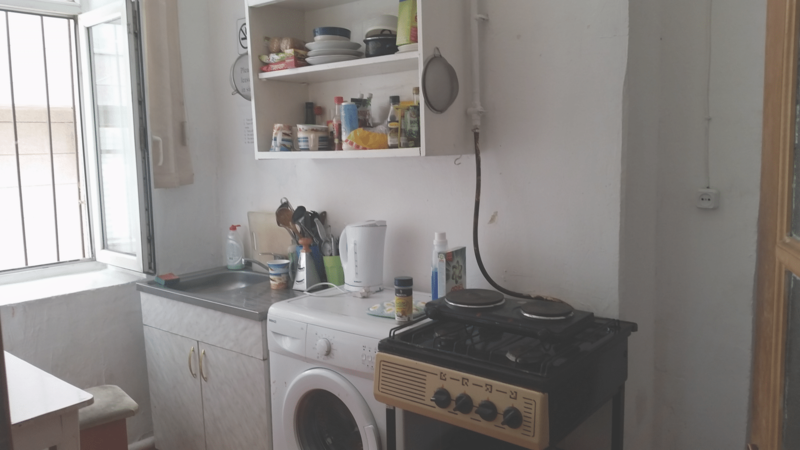 I was not encouraged to stray from this plan when I saw that the kitchen boasted only a hot plate in place of a stove and had no oven for heating frozen meals. However, I befriended Allie, who lived across the hall, and she was ready to cook. She had been in Bishkek for three weeks before I arrived, so for her the glamour of eating out every night had worn off. The problem was that neither of us knew how to cook. My experience ended at fried eggs and heating up corn dogs in the oven. Although we were intimidated, we made a list of simple dishes that we could make without an oven. Then we hit the Frunze Grocery Store in the nearby Vefa shopping center. We overcame our fear of handling raw meat and can now chop vegetables with relative ease, thanks in part to a borscht cooking class held by the London School. 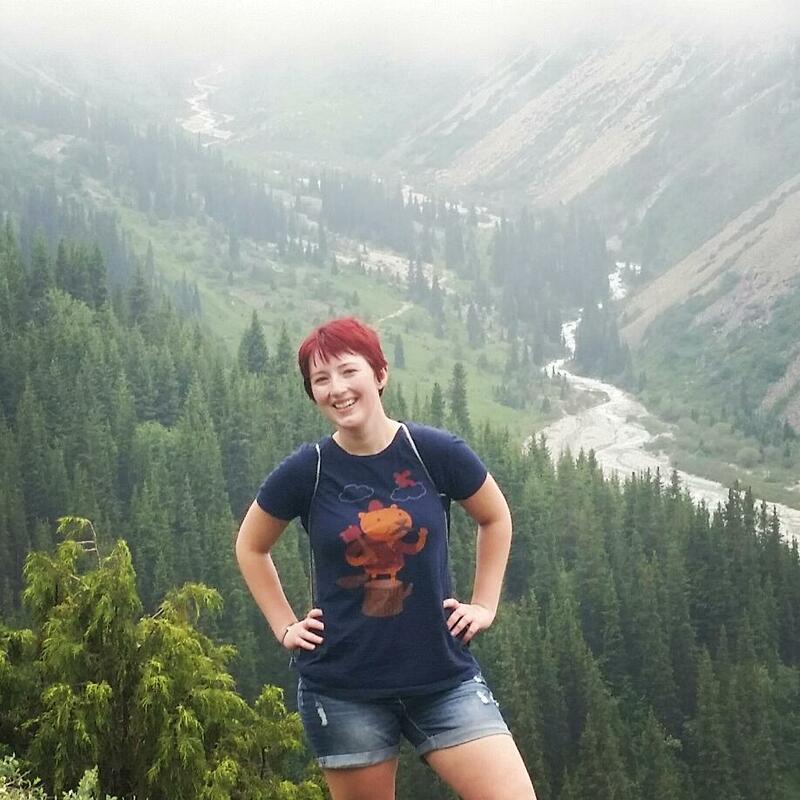 Allie’s mom made her pack Norton’s Nature’s Seasonings when she left for Bishkek, and it was lifesaving. We used it on everything we cooked because Frunze doesn’t stock herbs like basil or oregano. Frunze has boneless chicken and ground beef. We found tortillas at the Bishkek Supermarket, which was a 15-minute walk from the school to the south. You’ll notice a common theme in the recipes below: using carrots, peppers, and onions. Vefa doesn’t have celery, and the former three vegetables go well with many meals while giving you the vitamins and minerals that will be missing from the cafeteria lunches. Whenever one of the recipes calls for veggies: If applicable, peel the vegetable, then cut it in half a few times before chopping it as finely or coarsely as you like. Scoop the seeds out of the peppers. Soups are very easy and make a lot of leftovers that are easily reheated. Tacos, spaghetti, or quesadillas are simple alternatives for when it’s too hot for soup. Finally, purchase cling wrap to save your leftovers! 1. Cut up the chicken and chop the vegetables. 3. 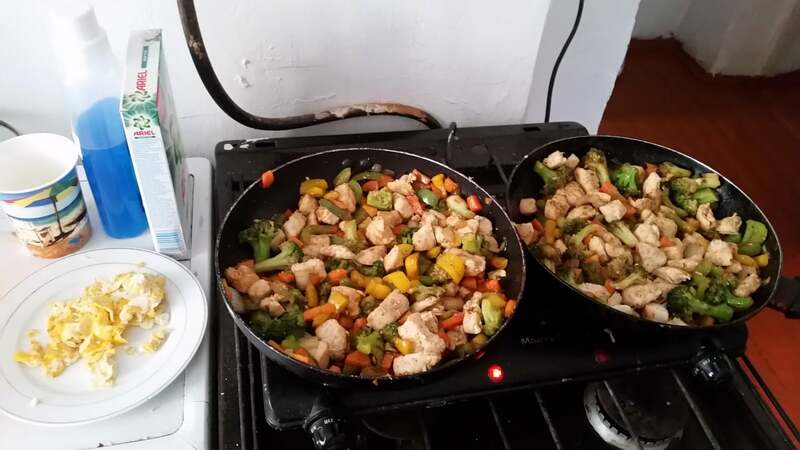 If you’re making stir fry with rice, boil the rice in a separate pot while you fry the vegetables and chicken. 4. When everything is cooked and soft, combine the rice with the chicken and vegetables. Then add teriyaki or soy sauce. When we made stir fry with rice and soy sauce, it could’ve used another spice for flavor, and the rice didn’t reheat very well. The next time we made stir fry, the teriyaki sauce was more flavorful, and it kept better without rice. 1. 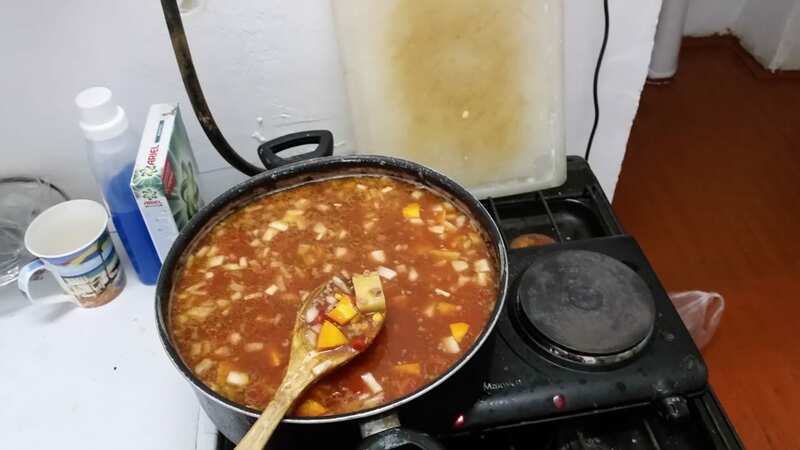 Cut up the chicken into cubes and boil it separately because it takes a long time for the large pot to heat up on the hot plate, and to avoid the risk of having raw chicken in the finished soup. 2. Chop the vegetables and add to a pot with water. 3. Add bouillon to the vegetables, which should boil until they are soft. 4. When the vegetables are soft, add the cooked chicken. Also throw in some Nature’s Seasonings (or another seasoning) to add flavor. 5. Let the chicken and vegetables simmer together for about 20 minutes. The soup, despite the Nature’s Seasonings, was a little plain, but was much better as leftovers after all the ingredients had time to sit together. We had a potato masher, so we decided to make mashed potatoes to pair with the chicken-noodle soup. 1. Boil the potatoes with some bouillon (we used the leftover chicken water from making the chicken noodle soup). 2. Add raw garlic after mashing the potatoes. We had a potato masher (which is why we decided to make mashed potatoes to pair with the chicken noodle soup), otherwise mashing the potatoes will probably take a long time. They could’ve used another spice, but with plenty of butter and Nature’s Seasonings, the mashed potatoes and soup were a sweet taste of home. 1. Fry the beef with onions. When the beef is cooked, add the seasoning and water so that the bottom is covered. 2. Let that simmer, drain it, and you’re ready for Taco Tuesday. The tortillas we found were very brittle, so they had to be torn and then made into mini tacos. 2. While you fry the beef, chop the vegetables however finely you’d like. Put the veggies in a pot with water, bouillon, and tomato paste. 3. After you add in the fried beef, let it cook on high heat for an hour, or until the potatoes are soft. It’s delicious and can provide lots of leftovers. Just rinse the veggies and chop them up to make an easy side salad. It’d be easy to add cooked chicken to make it an entrée. I found Italian dressing at Vefa, but it did not taste like Italian dressing in the US because mushrooms were a primary ingredient. 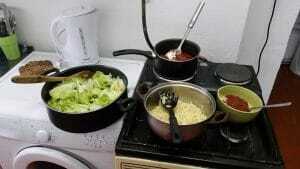 Spaghetti is a favorite dish among students in the dorm. However, you can make it much better and more filling by adding ground beef to the sauce and a packet of spaghetti seasoning. We also added chopped, raw garlic to the sauce to give it more flavor. 3. When the beef is cooked all the way through, add it to the saucepan. 4. Add spaghetti seasoning packet and chopped garlic to sauce. 5. Boil the noodles and drain when soft. There is pancake mix at Vefa, but no syrup. 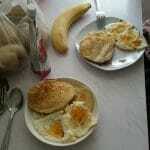 If you pair the pancakes with jam, pancakes and eggs provide an easy and satisfying breakfast or brunch. Don’t forget the Nature’s Seasonings for the eggs! 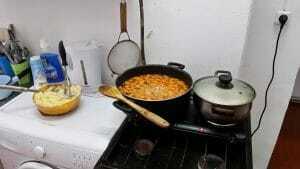 Your mealtimes in Bishkek don’t have to consist of nothing but plain pasta or eating out every night. 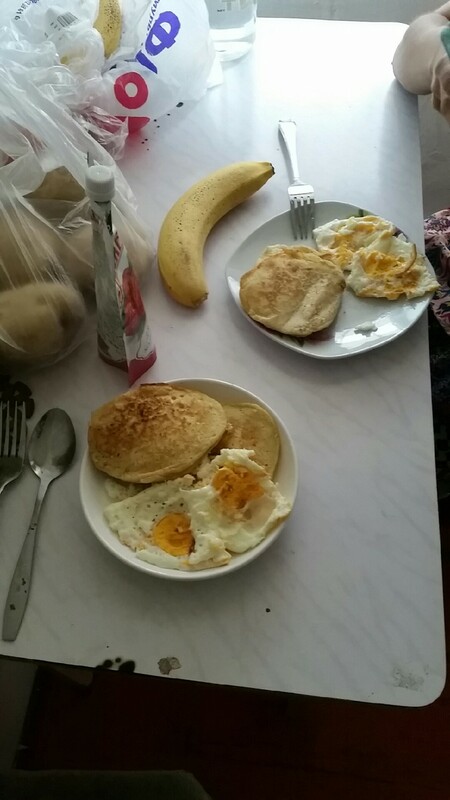 Grab a friend and look up easy meals to make without an oven, and you’ll be eating well while you’re in Bishkek! Allie and I had no cooking experience before coming to Kyrgyzstan, and now we easily whip up hearty meals that last us for a few days. We’ll now return home with improved Russian and the ability to cook.